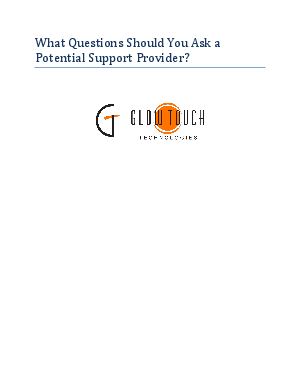 > GlowTouch > What Questions Should You Ask a Potential Support Provider? More and more companies are beginning to outsource their customer support in order to control costs, improve quality, and focus on core business functions. Download this whitepaper to see why organizations are making this switch and learn the right questions to ask your potential support provider to make sure you are getting exactly what your organization needs.